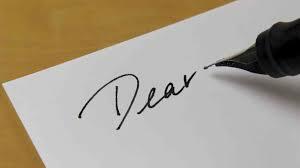 The Lost Art of Letter Writing..
Do you remember the last time when you wrote a letter to someone? Honestly, I can't tell when the last time I wrote a personal letter to someone. My last written communication was in the year 2009 when something was wrong with my SBI account and I wrote an application to the branch manager regarding that. But it's been 7 long years since I have not used pen and paper for writing anything thoughtful as a letter! Why am I tossing around letter writing? Because recently I got a chance to listen to a lady who made me realize that nothing can replace letter writing, although we now have better new age communication mediums like email, texting, Facebook and more. The lady, Laxmi, is a social entrepreneur and most importantly a family person. She shared that she traveled countries to countries for many years because of her work needs. And during these years, she couldn't meet her aging father with much of time. However, her father did an amazing thing in last two years of his life as he was continuously sick. He wrote letters to his daughter and filled a notebook with his thoughts about her. He addressed the strength and weaknesses of his daughter. He also gave her suggestions for improvement of her life in that notebook. After he passed away, Laxmi felt guilty of not giving much time to her father. But she has letters of her father and those letters changed her panorama about communication. Those handwritten letters still make her feel the presence of his father. Letters have the same, unique yet very known handwriting which is the best font of this world for her. Laxmi says "whenever I read these letters, I feel connected with my father. This is the same paper which my father had touched and now it is in my hands." How thoughtful is that! Far after we are gone, no one will care about the million texts we have sent. But a letter lasts. I have taken a mission; it is to convince others that handwritten letters should and could make a comeback! Every parent wants kids to inherit good part of his/her life. And I am thinking about passing the legacy of letter writing to my son. For that, I would also write letters to my son which I am hoping he'll read in future. You've such a wonderful perspective on letter writing. God knows I received my last letter written by someone a decade ago. I don't even remember when I wrote one! That said, would you be amenable to reading and reviewing a collection of short stories? Author Sharat Kumar has a collection of short stories coming out this time in January. In each of the 13 stories, uncovers the New Age woman and the chemistry between men and women in contemporary India. Whether spinning a yarn about an Army romance, or the affection between two divorcees; Kumar holds a mirror to how sparks fly. If you're interested, I'd love to provide a PDF of the upcoming book to be reviewed in your particular fun, free and fearless way. Just ping me back at the email address hritvick.dv(@)gmail dot com.